On Friday morning, Myron Martin, The Smith Center president and CEO, joined Gov. Brian Sandoval, former Lt. Gov. 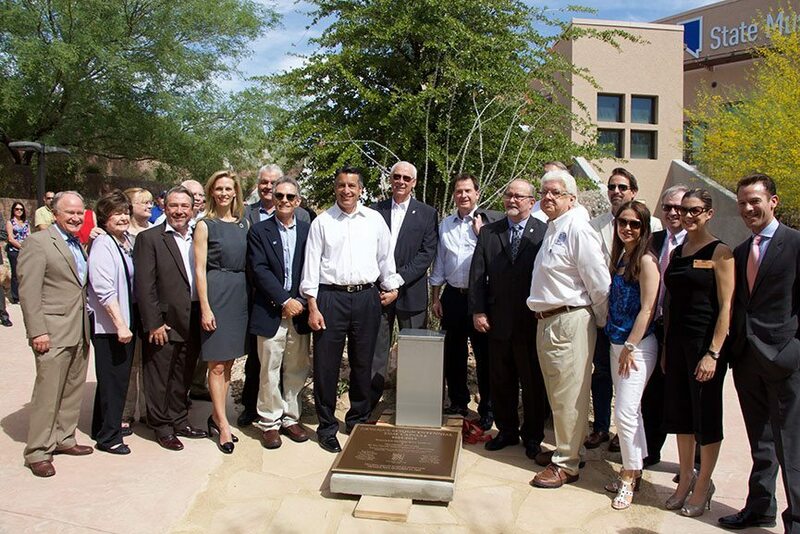 Brian Krolicki and other state and Clark County dignitaries outside the Nevada State Museum at the Springs Preserve to bury a time capsule honoring Nevada’s 150th anniversary. One of two archives to be entombed to celebrate the conclusion of the Silver State’s sesquicentennial – the other having been buried in Carson City late last year – the time capsule took the form of a rectangular metal container that will be sealed underground for 50 years. After an introduction by Krolicki, who chaired the Nevada 150 Commission that held hundreds of celebrations over the past two years, Sandoval began the process of filling the capsule with significant and commemorative articles, including a pen (in UNLV Rebel red) he has used to sign Nevada legislation. In succession, many of the gathered dignitaries spoke about the items they or their organizations were adding to the time capsule. Memorabilia ranging from a historical novel to a model Tesla car filled the weatherproof container. Martin, who was also a member of the Nevada 150 Commission, brought collectibles to contribute including a poster and program from Nevada Sesquicentennial All-Star Concert that was held in Reynolds Hall on Sept. 22, 2014. Part of the once-in-a-lifetime celebration included a performance by Las Vegas entertainer Frankie Moreno and Gilbert Magnet School students singing the state song. The act was so well received that The Smith Center produced a special-release cd and video of Moreno in studio with the students once again singing “Home Means Nevada.” Recorded Oct. 30, 2014, the cd was released to coincide with one of the culminating activities of the sesquicentennial – a record-breaking most people singing their state song at the same time. Myron Martin, The Smith Center president and CEO, at the plaque marking the time capsule’s burial place. Martin helps load the time capsule with commemorative items. It will be opened in 2064.